We were all up and about by 7am. Karen had cooked us a great breakfast these cycle rides are wonderful cos u can carbo load. Well that’s Graeme’s excuse for a fat boy breakfast. Leisurely breakfast with everyone as usual watching the weather forecast with immense interest. After breakfast we put our kit together for the day’s ride. 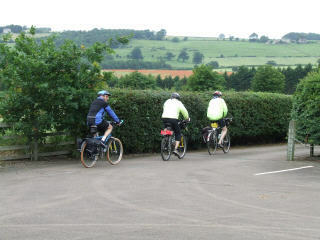 Today we were being dropped off by Karen at Corbridge and then cycling back to Bishop Auckland. 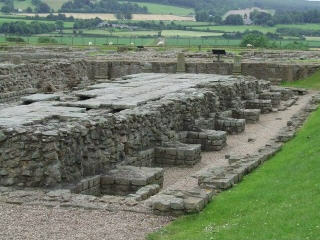 After several housekeeping duties around 9.15am we drove north up to Corbridge. 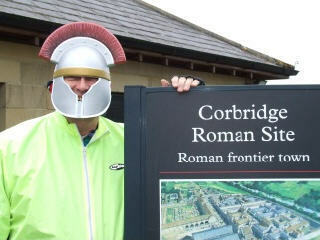 The start point was to be Corbridge Roman fort quiet car park to get kitted up and get the bikes ready. One or two minor adjustments were needed to the bike rack and we were on our way with Colin’s brand new panniers. Full of our lunch? 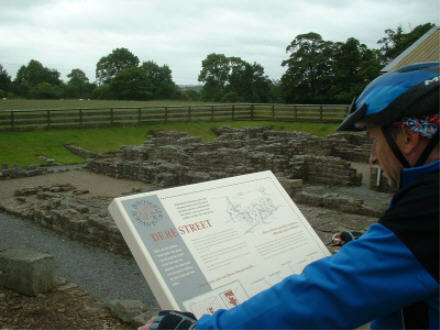 Pleasant uneventful ride up to Corbridge in less than an hour and we were in the Car park of the Roman Ruins. It was quiet until we arrived. Karen jumped over the fence for a photograph while we unloaded the bikes and got the kit together. We have been doing this for 10 years now and everything drops nicely into place or Does it? We call at the Gift shop for a trinket and a memento the Guy in the shop lets me borrow a Plastic Helmet and this causes great hilarity and I Bungious is born. Something to do with all the bungee ropes I always carry on my ride. 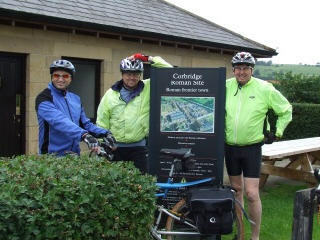 After the photos we are ready to go 11am...down the drive and right to Corbridge right onto Hadrian’s Cycleway. We only cycle 10 yards when the first breakdown occurs Its Colin, his panniers had wrapped into his spokes. Karen comes down the drive to find us all stopped. We wave on her way Colin can fix it? He does for a while. We eventually get going through Corbridge, Colin races a delivery van, and then out up a steady climb but we are fresh and in high spirits the bank is not a problem. Then down to the Tyne. A lovely ride on quiet roads along the side of the Tyne down to Ovingham. We cross the narrow bridge as we do so a lady crossing the opposite way in a Land Rover freelander scrubs her tyre on the side of the bridge girders. The tyre screams all the way across. Down along the Tyne lovely off road riding. As we get towards Wylam we pass a woman walking an Alsatian just as Colin passes his panniers collapse into the wheel spokes, this time big style locking the back wheel. The skid Causes the Alsatian to spook too. He never has much luck with dogs apart from his own. Dogs lying outside farms always wait till Graeme I cycle past then attack Colin. Much to our amusement. As the ride progresses the panniers are taken from the rack and he resorts to strapping them to the rear of the seat (Bungeed to the bike). 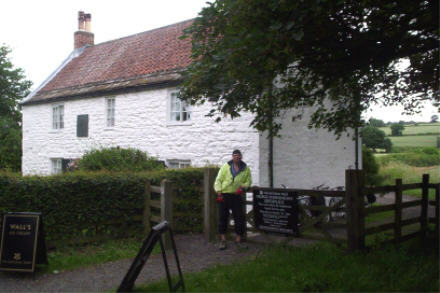 We pass George Stephenson’s (Stephenson’s Rocket fame) cottage right on the route (Railway theme) and down to Newburn short stop to read about the Battle of Newburn(more of a skirmish really) and over Scotswood Bridge and into Blaydon. 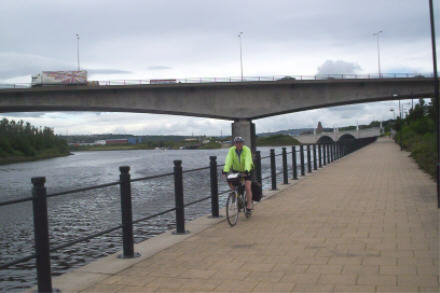 Pretty effortless we crossed the Tyne in Central Newcastle nearly all on cycle routes. 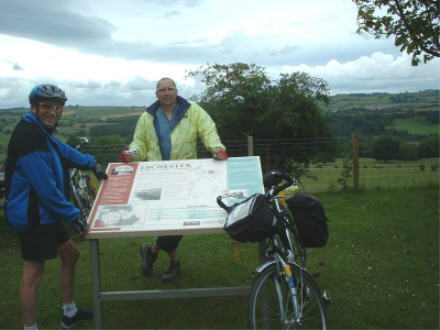 We were now on the CtoC cycle route (Coast to Coast). Up to Derwenthaugh Country Park where we stopped for lunch. It was then we discovered the true damage of the Pannier crash. Ripped and holed The lunch box had a hole in it too. Ah well Sandwiches were ok despite squashed Banana well one Banana was ok. We ate sandwiches reflecting on the last time we were at Derwenthaugh was 2000. We are slowly crossing over old ground I suppose we will the distances we are covering. As we were leaving I asked if anyone wanted a banana no reply I threw it in the bushes by the River. Just as Colin was asking where the banana was. So anyone from Blaydon reading this? That’s why a banana is growing in a bush in Blaydon? We are making good time even though the weather is overcast; we are now on the Coast to Coast cycle way a steady uphill gradient to Consett. It’s a great off road section quietly climbing. 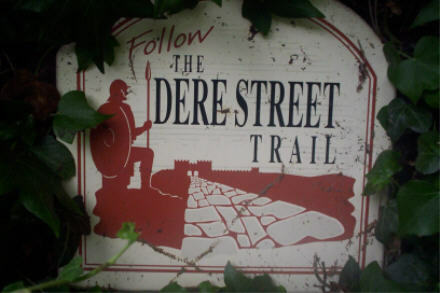 We go through the Derwenthaugh Park as we do we are following signs KITE WATCH? Red Kite a rare bird for this area County Durham. We could see the tents and several Twitches (Bird Spotters) by a tent on the River bank. It was now a steady climb about 16 miles? This leads me onto the next hilarity. The daily mileage I forecast it would be a 46 mile day. Graeme and Colin (with computers on their bikes) and local knowledge had worked it out we would be longer than that. I said 46 miles and we would be in Colin’s front room at 46 miles. How wrong can you be, read on? 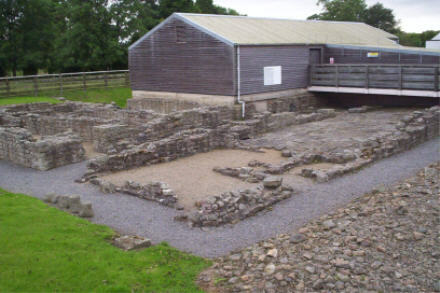 Next point of interest was the Roman fort at Ebchester it was here that we realised just how close we were following the Romans south. Then into Consett another shock. 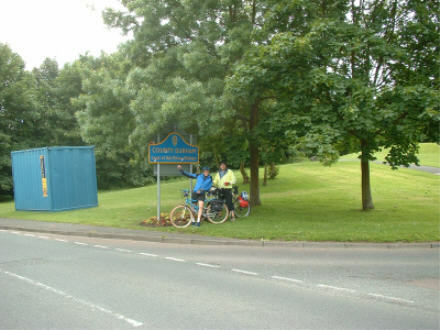 We have cycled through Consett before plus Coast to Coast rides on previous years. It had changed. A giant new housing complex and rebuilding it was busy and very different to as I had remembered. We stopped for a tea at MacDonald’s (no pretty picture box tearooms in Consett) and tried to work out the route. We were relying on Colin at this point as he had cycled it the year before on the CtoC but it had changed even in a year. 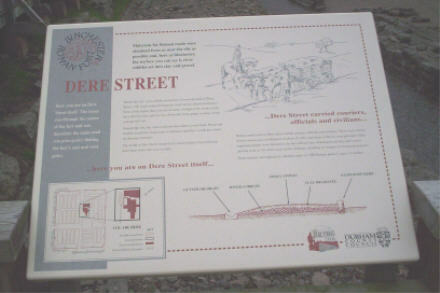 We could find signs for Whitehaven 106 miles useful but no local signs for the link to Durham city. Eventually we asked a guy walking a dog and we were 200 yards down hill and back en route. That was a multidaymen first asking directions, but then this as the first day we had not had Mr Map as navigator. 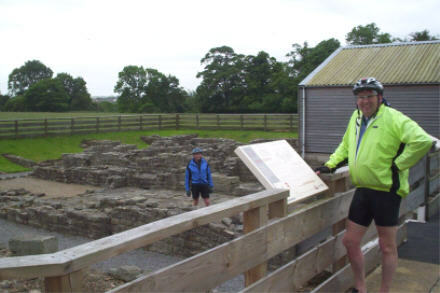 We were back on route and down via Lanchester (Dere Street again), Belmont just north of Durham City we swung south onto the WtoW Walney to the Wear cycle way signposted Bishop Auckland 12 miles. MMMMMM I was going to be well short in fact two miles along the track at Brandon the 46 miles was clocked up. Much to Colin’s and Graeme’s amusement. B and B in Brandon was what they suggested. Ah well this was not be the end of the mileage forecasts. 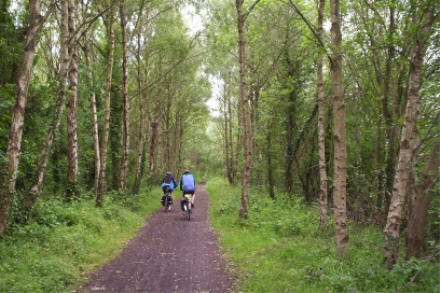 So we cycled on along the cycle track to Willington it was now detour time. After miles of railways tracks today was going to be a right sting in the tail. 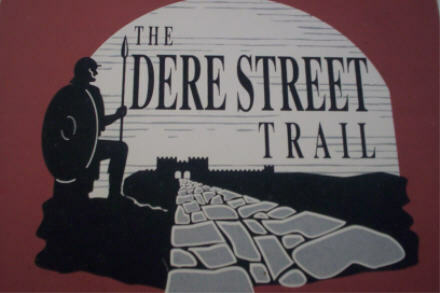 The detour was for Binchester Fort. I grew up 3 miles from Binchester and this was to be my first visit. We climbed Newfield bank which was steep in itself but the landfill site next to the road did not help. Newfield village and several tough climbs after 50 miles too. Eventually we got to Binchester camp it was cold and wet. The Place was closed but we had come so far so we climbed the fence and surveyed the site. Well preserved and guarding the Wear as it was designed for. . 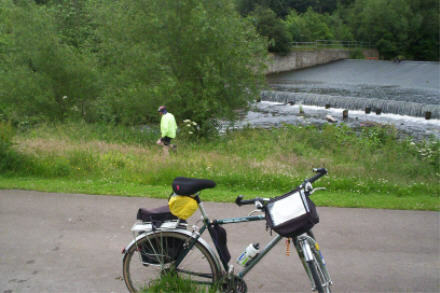 It was now just a steady ride into Bishop Auckland along by the river then up the Batts into the Market Place. The Batts is a very short sharp narrow steep hill, Graeme managed it but Colin and I pushed most of the way. A steady wet ride through Bishop Auckland and arrived at Colin’s at 7.15pm. A 59 mile day. A long but very enjoyable day. A cuppa and a shower and a soak, then we all drove into Bishop Auckland for Wetherspoons Curry night, and a couple of beers. Wetherspoons sell real ale so we sampled a couple. Graeme was not impressed with Auckland Glory. A pleasant evening with Karen, Suzanne and Christopher. Then back to Colin’s we all didn’t take much rocking.